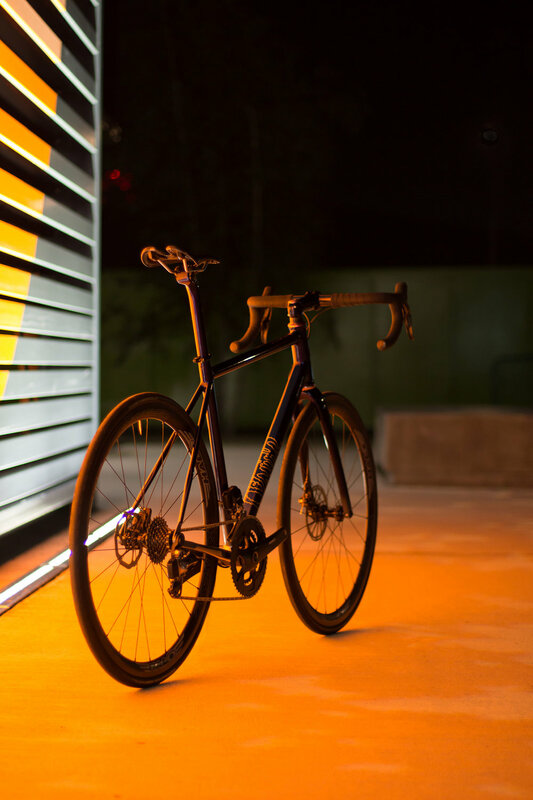 All-Road | Custom bespoke bicycles handmade in London — Quirk Cycles | Custom Steel Bicycles Handmade in London by Frame Builder Rob Quirk. Built to match your endurance and to eat miles with ease, the All-Road is designed to be pushed beyond limits. Road tested in Europe’s greatest ultra-endurance race the Transcontinental, this frame will carry you over and beyond the comfort of familiar lanes. Endurance and speed are the driving principles for the design mixing fast handling with a longer wheelbase for a stable lively ride. Disc equipped for reliable braking in all conditions and wide clearances to fit larger tyres for when the road gets rough, if you can only have one bike to do it all, this is it. We offer all our frames with full custom geometry to make your frame truly bespoke. We use only the best fitters here in the UK or if you prefer we can work from a fit you've already had. Alternatively we offer all our frames in standard geometries. At Quirk Cycles we work with the best painters in the UK who intimately know their craft, producing astounding finishes. Our frames come as standard in two colours but with a reputation for strong design why stop there? All our concepts are designed in house, worked in tandem with you to breathe life into your ideas and concepts. Ready to become a part of Team Quirk? Click the button below, select your options and we'll do the rest. Are you an ultra-distance racer or a weekend warrior? Tell us everything about your current riding habits, future goals and aspirations. Do you want us to help source parts for a complete build? This is where your frame truly becomes unique! Let us know how you would like you bike to look. Not sure? We can help with the design process or provide you with one of our in house schemes. We're sure there are a hundred things you'd like to tell us about your dream bike, tell us about anything we may not have covered. Thank you for thinking of Quirk Cycles! We've received your details and will be in touch shortly. Until then, keep rolling!